Keep an eye on the trail ahead and other riders around you with the Trail Tech Voyager Pro. Link up a total of 20 Voyager Pro units together for on-screen tracking like no other. See the exact position of your friends and come to each other's aid with emergency beacon alerts. Ride along uploaded GPX routes or record new ones to share. Voyager Pro is Bluetooth enabled for intercom, phone and media controls. Play songs from your phone or MicroSD card using a Bluetooth headset, speaker, or intercom. Two phones and two headsets can be connected at the same time. Record or load GPX trails and riding areas, and transfer to a PC using the MicroSD card. 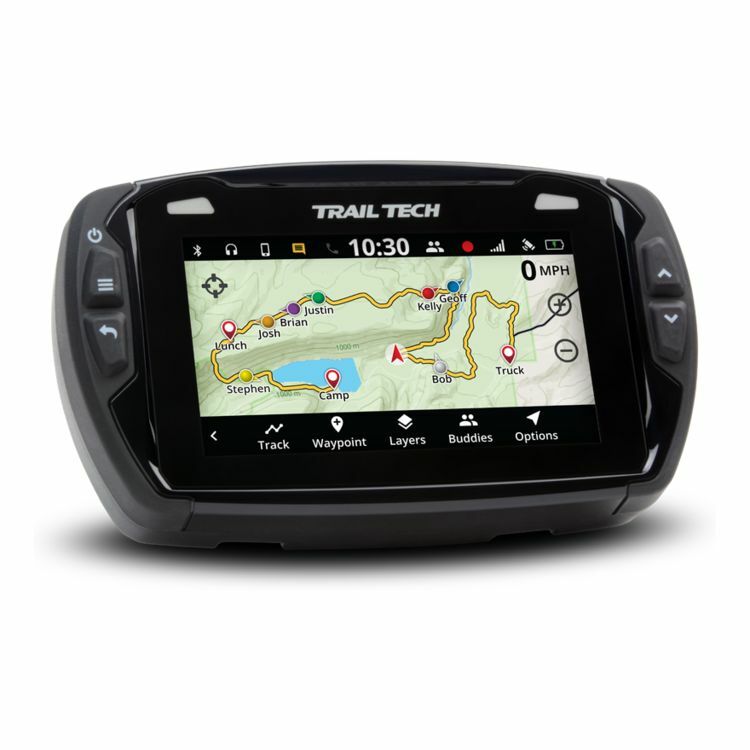 Voyager Pro comes loaded with North American maps, but other map regions can be downloaded for free via Trail Tech's website. The Voyager Pro excels as a stand-alone GPS unit but it also accepts included Trail Tech vehicle sensors to provide vital ride data such as engine temperature, RPM, battery voltage, speed/distance and more. Note: Buddy Tracking currently enabled and legal to use in the Americas and Australia / New Zealand only. Tachometer and engine temperature displays require additional bike-specific sensors.